Keep leftover onion halves, wedges, and slices, fresh and firm in the fridge. 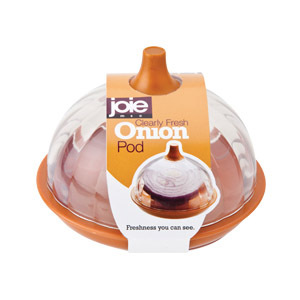 Cleverly shaped like an onion, this storage pod also helps to organize your fridge in style while eliminating the need for plastic wrap or sandwich bags. Simply place the onion, cut side down, on the plastic base, and then place the plastic cover over it. Easily store onion halves and wedges. Make that second half last longer. Also great for lunch packs and lunch boxes. Crafted from durable and BPA-free plastic. Makes a great gift for your favorite chef.